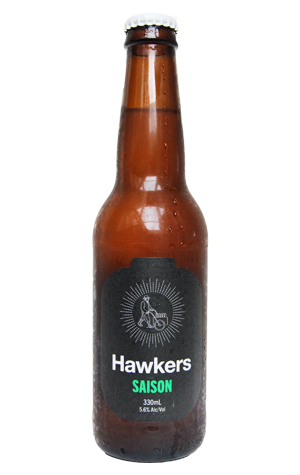 The fourth (and, we believe, final) beer to form the Hawkers core range is this Saison. It's fitting as, when doing their groundwork for Hawkers, it was sampling a saison at Bright Brewery that Mazen's eyes lit up. Impressed by the beer and subsequently by its brewer, Jon Seltin, it was the moment that led to the two working together at Hawkers. The beer they've created at Hawkers is another, like their Pale, that leaps out of the glass. There's lemon and bitter orange peel at work with the soft spices from the Belgian yeast on the nose with high carbonation there to balance the cloudy orange-golden beer's relatively full body. A peppery dryness counters the fruity, sweet malt and lingers long on the palate too.